1. Your jewellery should be the last thing you put on, AFTER you have dressed and applied any cosmetics, hairspray, perfume, lotions etc. These products can dull and even harm your jewellery. 2. Clean your jewellery with a soft cloth after you take it off and before putting it away. This will remove the oils and debris picked up throughout the day and helps prevent tarnish. 3. Do not sleep with your jewellery on. This causes unnecessary stress on the components. 4. Remove jewellery before doing household chores. Many household cleaners contain chemicals that are harmful to jewellery. 5. Do not wear your jewellery when swimming or in the shower. Avoid wearing it around chlorinated pools and hot tubs, salt water, mineral springs and suntan lotion, as the reaction with the metal can severely discolour and damage jewellery as well as loosen stones and settings. 6. When not wearing your jewellery, store it in a cool, dry place away from direct sunlight. 7. Keep your jewellery pieces separated to avoid scratching. I recommend storing each piece in its own ziplock bag with the air squeezed out. 8. 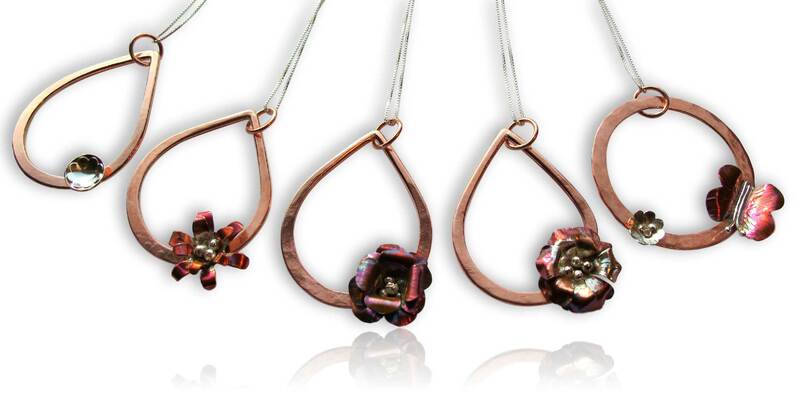 Exposure to oxygen, humidity and moisture causes oxidation on metals such as sterling silver, copper and brass. High humidity will make natural oxidation happen faster and, of course, individual body chemistry is also a factor. If you experience any skin discolouration, don’t worry because it will wash off with a little soap and water. 9. If your piece was purposely oxidized to enhance texture and/or design elements, be very careful when cleaning it, as many commercial formulas will remove the patina. 10. Copper is particularly prone to oxidation. If you prefer the shiny look, the piece can be rubbed gently with a mixture of freshly-squeezed lemon juice and small amount of salt. Rinse well in cool water and pat dry before storing. Keep in mind that this method will remove any patina as described in item #9 above, and should be used with caution.